Four months ago I began to experience eye strain and slightly blurred vision in my left eye. As reading became difficult and night driving getting very difficult, I thought my Lasik correction 10 years ago was starting to change, so I went in. Diagnosed with Advanced Dry AMD in the left eye. Right eye is 20/20 and the left eye 20/100+1 distorted. Left eye has a permanent gray spot in the center of vision with 5 lines on the grid distorted. I was told that it was nothing I did wrong and this disease just happens, although it does not run in my family at all. So for the past 5 days, I've started to take Occuvite vitamins and test my eyes on the grid everyday wondering if I'm going to wake up with wet AMD or if the right eye will be affected. I can imagine my story is not new to folks with AMD. I have to admit, after 5 days, I'm still pretty shaken up over this diagnosis and prognosis. Thank you Dwight for sharing your story. It is a disturbing diagnosis and full of "unknowns." In addition to taking eye vitamins learn how you can reduce chronic inflammation. 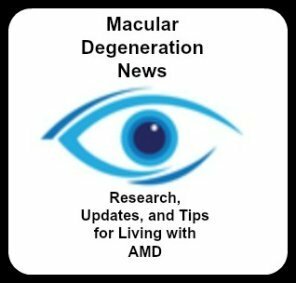 Macular degeneration is associated with an inflammatory pathway. It's been about 9 years since my wet AMD was diagnosed a John's Hopkins for the left eye. Subsequent injections didn't work. The right eye has dry AMD, but it functions well, and does not appear to be deteriorating. I take drops for glaucoma to keep the pressure down. Statistics are there to be ignored, I think. At JH I was told I stood a 95% chance of keeping the same vision in the left eye, and I had a 25% chance of losing the right. Of course that 25% just about applies to anyone. I take the ARED's potion every day. I eat plenty of greens and fish and very little junk, mainly seizing on a chocolate bar once in a while. It is harder to read the really small print and if the light isn't right, reading in general is not easy. I have to be careful in navigating stairs and bumpy sidewalks, and I have poured wine directly on to the table. But there's no point in imagining the worst. When the time comes, if it does come, you will adjust. Or else some surprise will come along and life will be exciting in a new way. I am not sentimental here. It's just that life is so rich and complex it should not be reduced to a Reader's Digest level. Not saying you are doing this, but it's just a realistic thought.